From what I researched on the Web beforehand, if you want to go to a game, tickets are not too difficult to get ahold of. I went to the stadium 30 minutes before the game started and was easily able to buy a ticket without waiting in a very long line. One piece of advice that I read though is that you may not be able to do this if they are playing the Giants, as most Giants games sell out. Tickets may also be more expensive. In that case, you can buy tickets on their website if you can read Japanese, or you can buy them at ticket machines in some convenience stores such as Lawson and Family Mart. When you’re a tall westerner in Tokyo there are certain things apparent that they are not made for you, and the seating in the stadium was one of them. I am 6’3″ and unfortunately found the seats very uncomfortable, especially if there are others sitting on either side of you. Luckily, the couple to my left disappeared after 3 innings of play and I was able to stretch my legs out to the side. But even then, the seat was just not comfortable for me to sit in. This is not meant to say you shouldn’t go, however, it’s just a warning if you are tall like me. The starting pitcher for the Swallows that night was Yuki Shichijo. The Swallows were playing the Yokohama DeNA BayStars. DeNA is a mobile game company that owns the team. At one point during the game, I got up and went to the concession stand area to get something to drink. I asked for a Coke, but what I got was something else entirely. Actually, I think it was some flavor of Fanta, but I couldn’t tell what flavor it was, and it was a sort of white-clear liquid. It tasted fine though, for not being able to tell what it actually tasted like. There are very few differences between baseball in Japan and in the United States. One difference is that in Japan, games that are tied at the end of the 9th inning only go to 12 innings before being declared a tie, and playoff games only go to 15, and must be replayed if they are still tied. In most games though, everything will be very familiar. One thing I found interesting was fans’ reaction to the home team scoring. First, the home teams’ fans sit on the first base side, while visiting team fans sit on the third base side. I decided to sit with the home team. So when the Swallows scored for the first time, almost everyone around me got out these colored umbrellas and started raising them in the air. It was very different from being at an American baseball game because of how coordinated the fans were. My question was, why didn’t I get an umbrella? I guess they either bought them at the game or brought them from home. I was just surprised to see so many fans with them, and with the same color. One highlight of the game was when the opposing team’s manager came out to dispute a call. I can’t remember what he didn’t agree with, but he was upset enough that the umpire threw him out of the game for arguing too much. I admit I didn’t stay until the end of the game, only because I was very uncomfortable from sitting in the tiny seat for so long. I considered just going and standing at the back to finish the game, but I didn’t want to be asked to sit down by an attendant and not know what they were saying. I am usually someone who is baffled by people who leave sports games early, but in this case I made an exception and left in the 8th inning. The final result was 2-1 in favor of the Swallows. 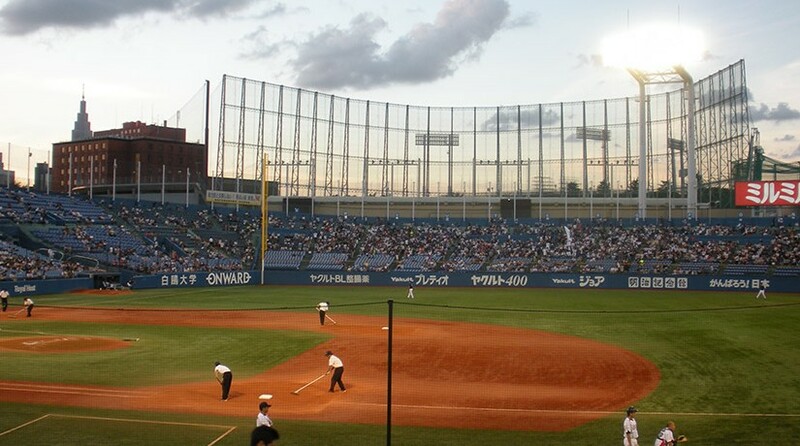 Have you been to a Japanese baseball game before, or do you have questions about attending? Let me know below. I played for Yakult for 2 years! Love it!